These fluffy vegan scones are the perfect addition to any afternoon tea. They are light, airy, and taste delicious served with vegan clotted cream and jam. 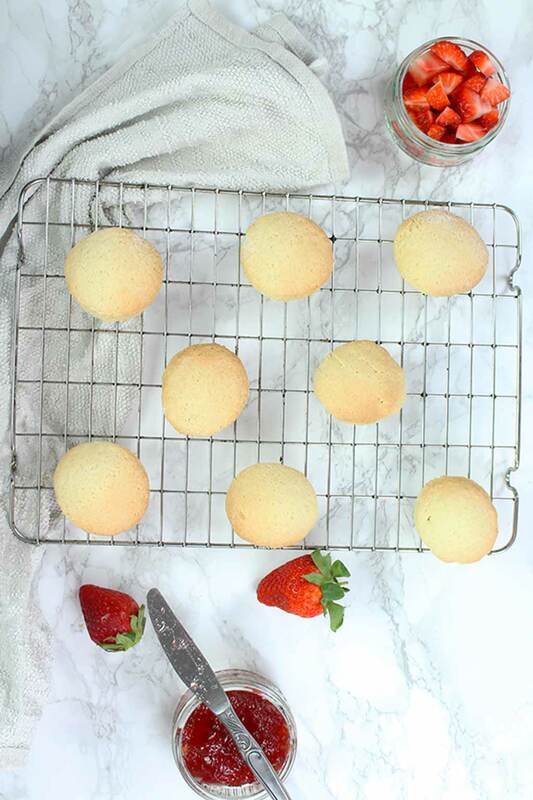 If you love afternoon tea, you’re going to love this recipe! I don’t exactly remember the very first time I ever tasted a scone. But I do know that my great-grandmother had a huge influence on my love for them. She was the best baker- always filling us up with all kinds of cakes and pancakes when we were little kids. But best of all was her scone recipe! They were so light and fluffy, and she used to serve them with clotted cream and raspberry jam. We couldn’t get enough of them. So with Mother’s Day coming up here in the UK, I thought it’d be nice to share my own fluffy vegan scones recipe. I think they would make the perfect addition to a lovely afternoon tea, along with some other baked goods and sandwiches to celebrate with mum! I adapted this vegan scone recipe from the coconut scones I made when I first started this blog. 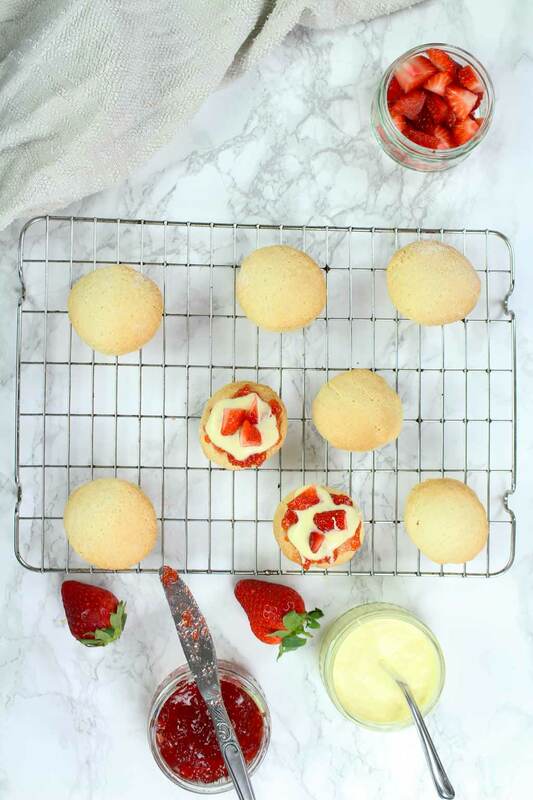 But this recipe for plain scones is just as delicious, if not even better! The scones have only 4 ingredients and are one of the easiest recipes I have on this site. They take just 15 minutes to bake! They’re great alone but feel free to top them with your favourite jam and some delicious (vegan) clotted cream for a real treat. I’m not kidding when I tell you these vegan scones are incredibly easy! Place some flour into a small bowl. I like to use self-raising flour to save the need for baking soda or powder. Next, add your vegan butter. 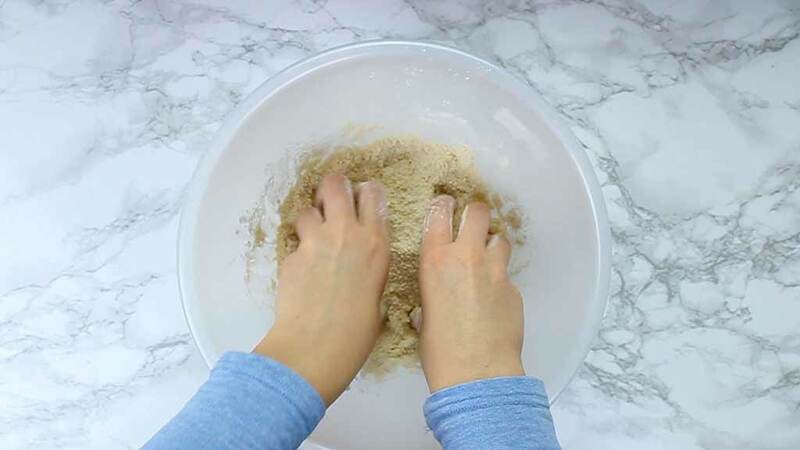 Rub it into the flour to make a breadcrumb consistency. It’s best that the butter is cold rather than room temperature, as this will prevent it from melting into the flour. If you’re celiac or would prefer to have gluten-free scones, you can simply use equal amounts of a gluten-free flour blend. Make sure it’s self-raising too though. Stir in your caster (a.k.a. super-fine) sugar. This adds a touch of sweetness without overpowering the flavour of the scones. I used soy milk but you can also use almond milk, coconut milk or any other milk you like. Start with 120ml (1/2 cup) and pour it in bit by bit. Stir the milk into your dry ingredients mixture until JUST combined. 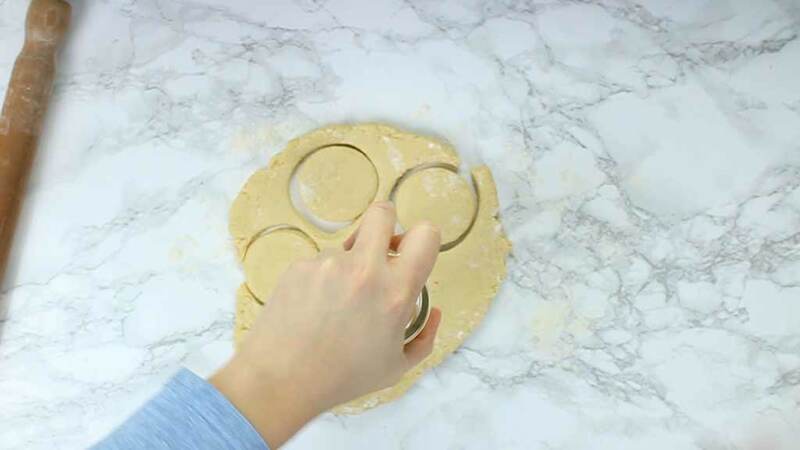 Use your hands to form a slightly sticky dough. You don’t want to overwork the dough here or you’ll end up with scones that are really tough. Add in any additional fruit or flavourings you like. Some nice ideas would be raisins, dried apricots, cinnamon or coconut. Of course, this step is totally optional. I personally like to leave them plain and add lots of flavour with jam and fruit at the end! On a lightly floured surface, roll out your dough to about 1 inch thick. 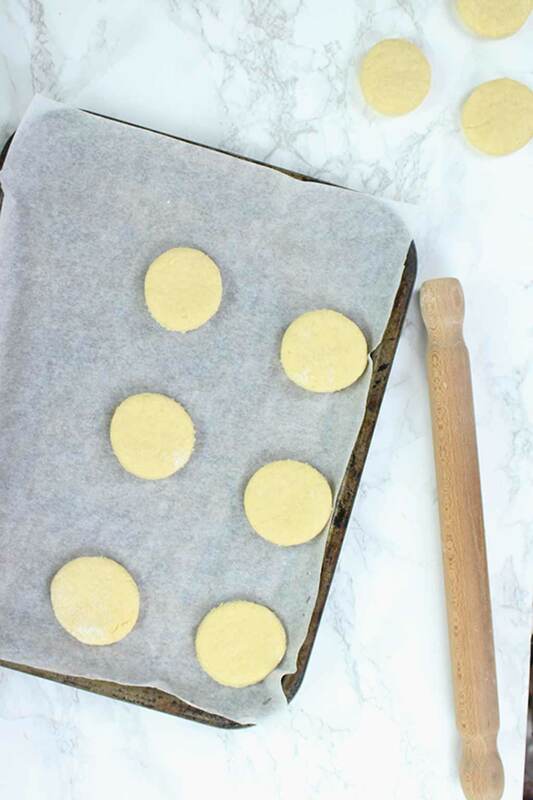 Use a cookie cutter to cut your scone shapes before placing onto a lined baking tray. I like to use the bottom of a glass instead of a cookie cutter because it gives a smoother edge. But feel free to do whatever suits your taste best. Bake the scones in a preheated oven for around 12 to 15 minutes. They should puff up and become nice and fluffy. Transfer them onto a wire rack and allow them to cool completely. 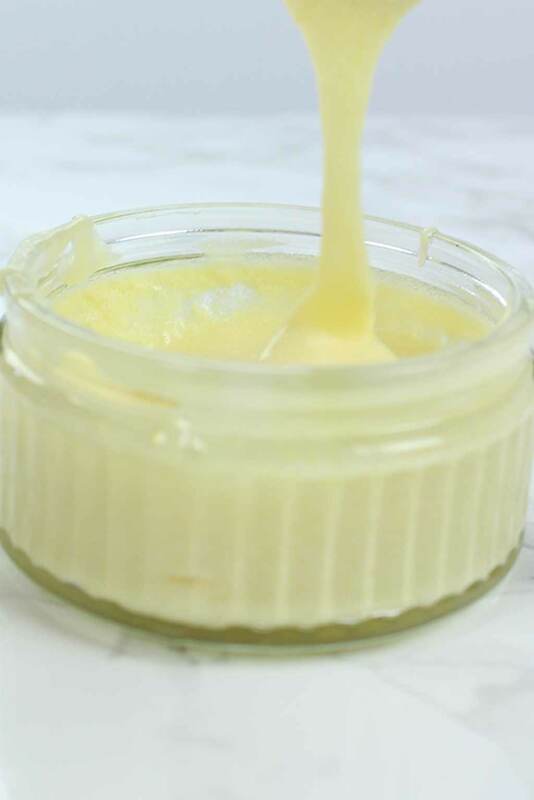 In the meantime, you can start preparing your vegan clotted cream. Clotted cream traditionally involves the use of dairy cream. Making it the traditional way is also a very slow process. So technically, this vegan recipe isn’t exactly “clotted” cream. But the taste is quite similar and it’s a great alternative for those who don’t eat dairy. The first step for the cream filling is to cream some butter and sugar together in a bowl. I like to use an electric whisk for this to make it faster. Next, start adding in your vegan cream. I used soy cream purely because its flavour is undetectable in the finished product. If you’re not a fan of soy, you can also use oat cream or full-fat coconut milk. Keep in mind though that these flavours might be quite overpowering. Mix in the cream, one tablespoon at a time, until you reach your desired consistency. Placing it in the fridge before serving will help it to firm up a little bit more. Now it’s time to eat! Enjoy these vegan scones with your “clotted” cream and your favourite jam. I personally love strawberry jam, and I also added some sliced strawberries on top which made an excellent addition. I hope these fluffy vegan scones make an appearance at your next afternoon tea! If you make them yourself, please let me know by leaving a comment below. Or tag me on Instagram @bakedbyclo. 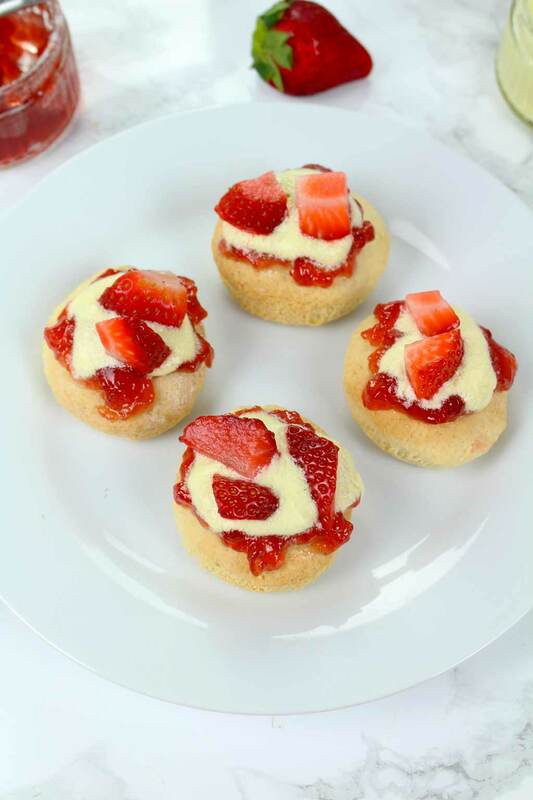 An easy recipe for plain scones, served with vegan clotted cream and strawberry jam. Preheat the oven to 200C/ 290F and line a baking tray with parchment paper. 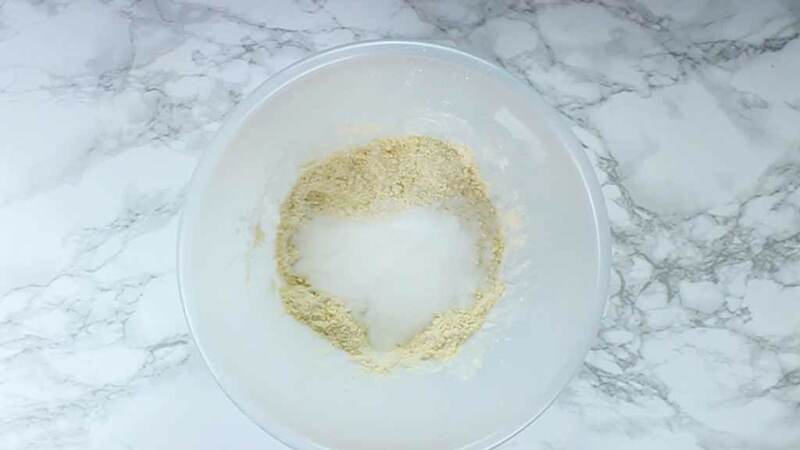 Place your flour in a bowl and add your vegan butter. Rub the butter into the flour to make a breadcrumb consistency. Add in the milk, a little at a time. 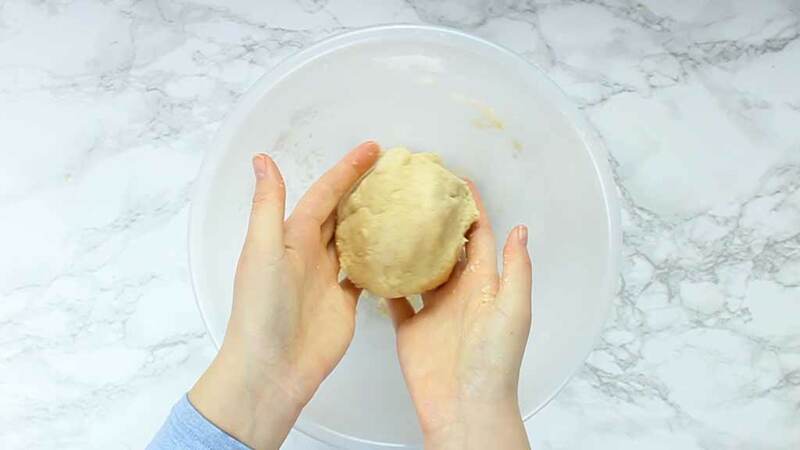 Mix briefly then use your hands to form a slightly sticky dough (be gentle with this- don't knead or overwork it). Roll the dough out to around 1 inch thick on a lightly floured surface. 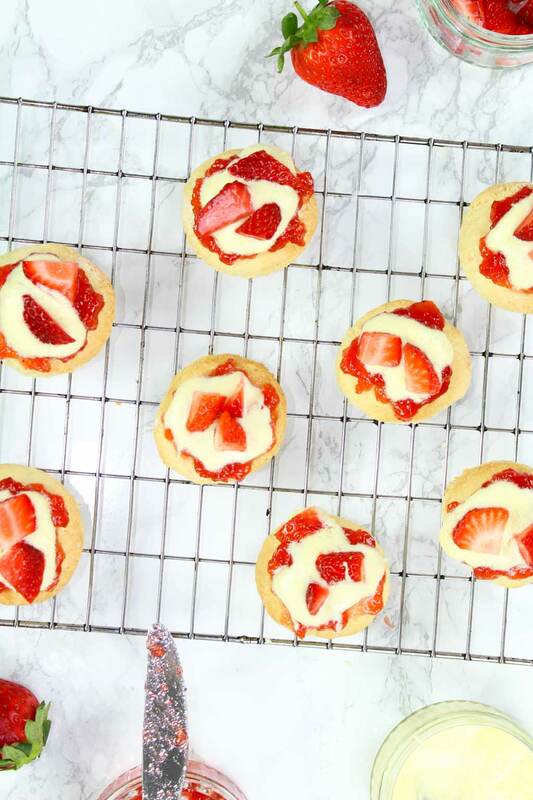 Cut out your scone shapes using a cookie cutter or the bottom of a small glass. 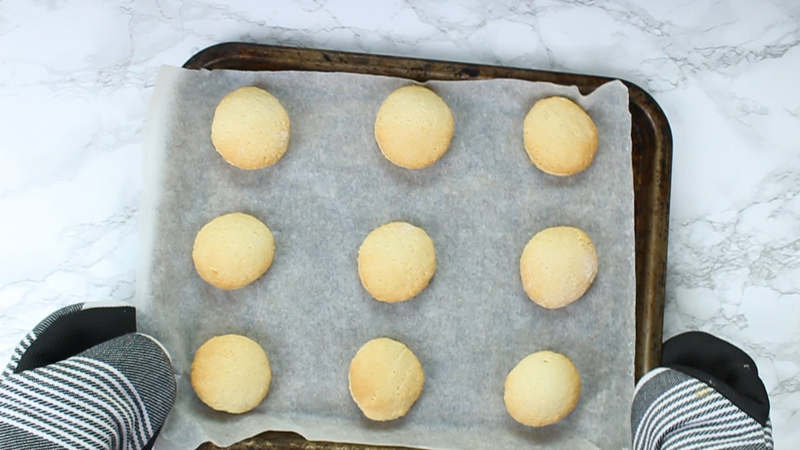 Place the scones onto your baking tray and bake for 12-15 minutes until golden brown on top then transfer to a wire rack to cool. Mix together your butter and icing sugar using an electric whisk. Mix in your cream, 1 tablespoon at a time, until you get the consistency that you're looking for. If it's too runny, add more icing sugar and if it's too dry, add more cream. 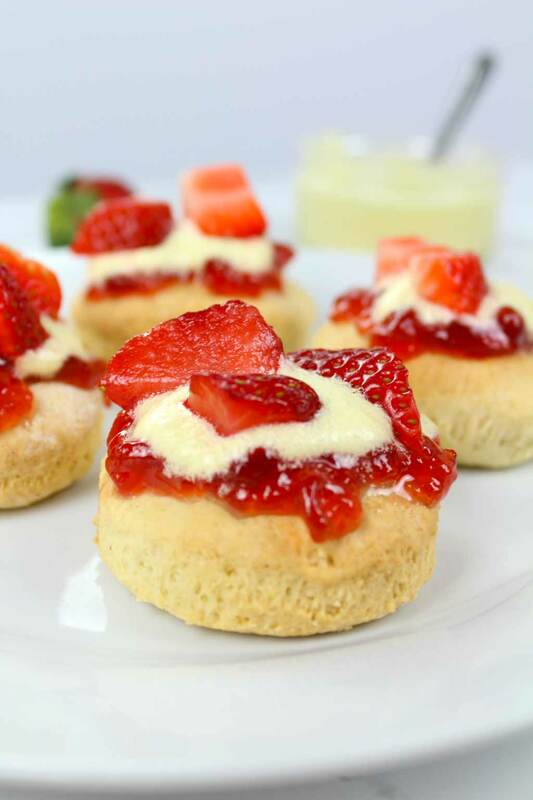 Serve your scones with strawberry jam, the clotted cream, some chopped strawberries, and a nice afternoon cup of tea! *The scones can be stored without toppings, in an airtight container at room temperature for up to 5 days. *Clotted cream can be covered and stored in the fridge for 3-4 days. * All values are an estimate only and will vary depending on the food brands used. These went down well with the whole family and were so easy to make. Lovely and light and made the perfect treat for after noon tea.